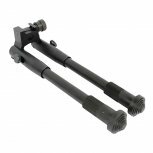 The Picatinny Bipod by Killhouse Weapon Systems is a universal bipod that will fit almost any gun, and will give your gun the stable shooting platform you need to take your best shot. Folds back against your barrel when not in use. Spring-loaded telescopic legs lock into position. Mounts directly a Piccatinny (Weaver) mounting rail using a thumbscrew. Very unobtrusive and compact design. Can easily be mounted backwards to have the legs folded alongside the sides of a thin-body marker. With a simple RIS handguard or the stock barrel mount, this only takes up a few inches of underbarrel room, leaving plenty for a second forward attachment while providing plenty of stability. great for low cover, adjustable legs stick really bad because of the turning knobs. fairly easy to flip down but as with most you need to flip the legs down separate which takes time. this product will add some weight to the front of your marker making it harder to move through buildings, heavy brush and grass because it will get caught on branches. also the barrel mount did not fit my barrel. which is a standard for most markers, not sure if it was a defect or if they sent me the wrong one. but it also had a picatinny mount which works excellent. mounted on my barrel to provide a stable platform when hiding down low in cover. works great and provides a lot of easy mounting options with the pitcany or barrel mounts. Really easy to flip the legs up or down, sturdy construction.